Year in, year out, there is one institution that can’t be missing from the Summer Breeze inauguration. Conducted by Herr Harich Günther, the local marching band Musikverein Illenschwang once again had the honour to kick off the festival in its 15th installment. It was a question of honour to have a big audience on this extremely hot Wednesday, so Herr Günther had an easy task in getting the people going. Right from the start there were circle pits, which again and again got into position for a wall of death (!). There was also a conga line every once in a while, giving the folksy sideshow an adequate framework. For an hour Musikverein Illenschwang had the audience on their side and even did some requests. In addition to their usual professionalism, this time the band even had merch available. Way to finance the next garden party. Prost! 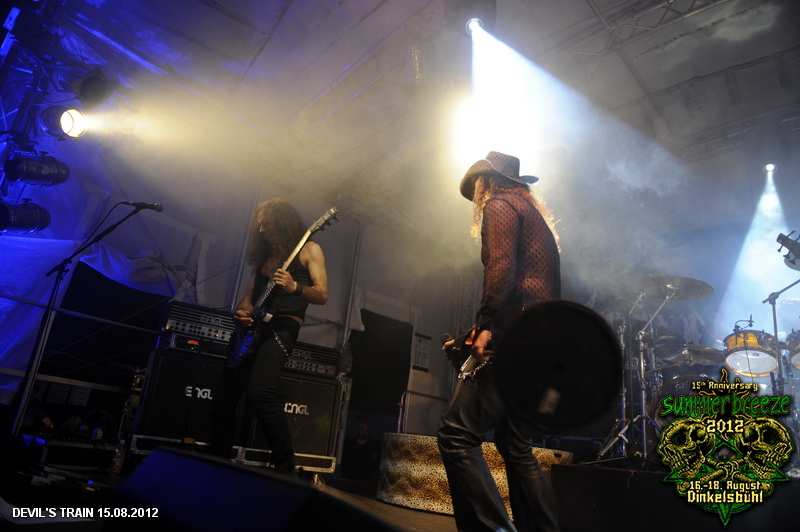 Under blue skies and 30° centigrade, the Munich death metal combo ARSIRIUS had the honour to open the NEW BLOOD AWARD. While surprisingly many party-hungry metalheads had found their way to the Party Tent to attend this grand opening, ARSIRIUS gave their best to impress both audience and jury. 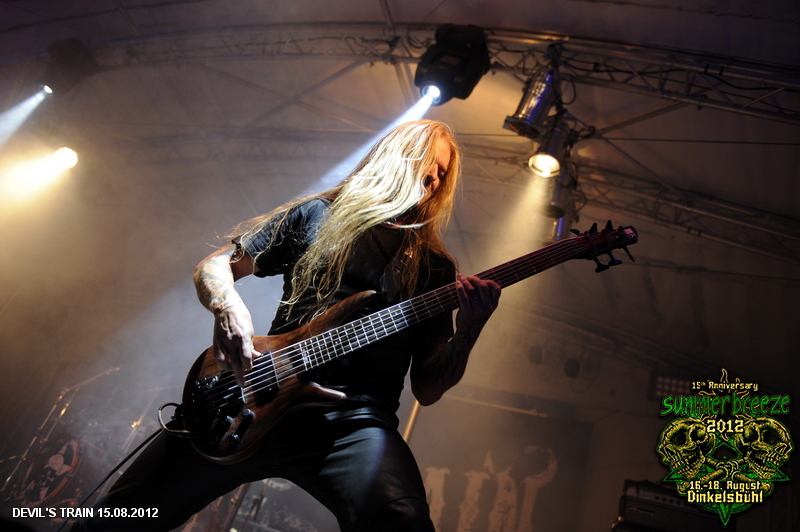 Brutal screams greeted the masses, and the opener “Arcanum” was already full power ahead. The crowd didn’t have to be asked twice, starting to mosh straight away and forming the first cicle pit soon enough. Alternating driving mid-tempo mosh parts and riffs that were equally as compact as they were complex, the quintet got a head start, and the 25 minutes of stage time seemed like seconds. At the end there were even calls for an encore, which couldn’t be fulfilled out of respect for the other participating bands. All in all it was a great start for this awesome contest. WITHOUT WORDS were the youngest participants who had made it into the NEW BLOOD AWARD finale this year, but they didn’t let it show at any second. From the opening track “Deny Me” they presented professional metalcore a la CALIBAN. 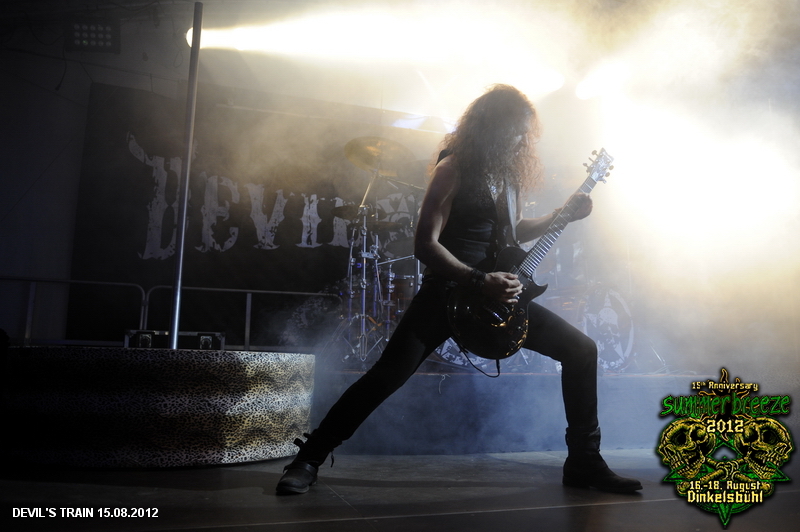 Swedish riffs, screams alternating with clean vocals and brutal breaks invited the crowd to mosh. In the meantime the number of metalheads in attendance had grown noticeably, people were jumping, moshing and headbanging, and the melodic trade-offs between the two guitarists were met with approval. In accordance with the band tradition, the song “Circle Of Pain” was accompanied with a huge circle pit, and when the band asked for a wall of death during “Symptoms Of Suffocation”, there were no holds barred. The band was also seen off with calls for an encore after six very strong songs, and the band members took many grateful bows. There is definitely a huge potential in this band, so let’s see what the future brings for WITHOUT WORDS. A 16-hour journey in a broken van and loads of sweat were what the fancy lady and her four cohorts had to endure en route to SUMMER BREEZE before their first song “Vestiez” poured out of the PA at the late afternoon. The following 25 minutes were equally unconventional as sometimes disturbing. Vocalist Zofia had wrapped her arms in bands of white cloth like a mummy and emanated a fascinating, inimitable stage presence. Words can hardly describe the music of OBSCURE SPHINX, ranking somewhere in between hipnotic sound fragments, which Zofia conjured from her sampling machine, ultra heavy, NEUROSIS-style riffs and apocalyptic vocals. Warsaw’s OBSCURE SPHINX delved into a dark musical parallel universe, dragging the audience along in spite the glaring sun. Despite – or maybe even because of – the minimalistic sound fragments, the band was present at all times, and it quickly became clear the Poles were strong contenders for the NEW BLOOD AWARD. No wonder there were people calling for an enconre all the way to the back of the crowd after the set, which consisted of only two overlong songs. After OBSCURE SPHINX it was time for some contrast. France’s AMOEBA went fo it, leaving little doubt about their technical abilities. 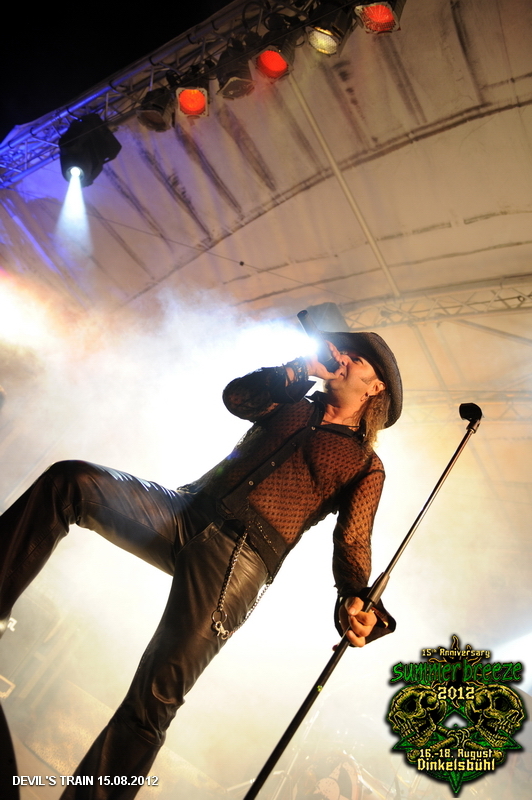 The sound was brutal and singer Lucas dove into vocal depths that were hard to top in terms of sheer intensity. Their high-level deathcore filled the tent quickly, and the first circle pit was rotating pretty soon. Visibly inspired by the crowd reactions, the singer drove his three bandmates to a top performance. Especially bassist Simon, who after a short warm-up phase started to shred the bass at breakneck speed, formed a massive rhythm wall alongside drummer Louis, which came crashing down on the audience. “In your face” seemed to be the youngsters’ motto, but never losing control of their instruments or the audience. Up to the last minute AMOEBA’s soundstorm ruled the place, giving the crowd little to no breaks to take a breath. So it was hardly surprising the four-piece left behind an exhausted yet satisfied audience after their 25-minute show. Great gig by a very young band – definitely not their last in front of a big audience. After AMOEBA packed a brutal death metal punch, playing a STRATOVARIUS CD during changeover came close to grievous bodily harm, but surprise: Romania’s GOODBYE TO GRAVITY served an accomplished mix of modern and power metal, so it was an almost endearing transition. From the very first second it was clear the musicians at work were experienced professionals. All of them very tight on their instruments, they moved a lot on stage, and singer Andrei Galut’s poses as well as his vocal lines were nothing but perfect. This is the guy who won Romania’s casting show Megastar in 2008! Before they closed the show with “Between The Tides” there was a big scrap for the shirts the band threw into the crowd. Seems like people liked what they saw! This band definitely deserved the prize for the most creative intro of the day. With music in the style of American TV series in the background, a voice proclaimed: “In today’s episode, BUFFET OF FATE play the legendary SUMMER BREEZE festival. Let’s see if the Party Tent can live up to its name. Find out for yourselves with BUFFET OF FATE!” And then it was too late for regrets, for the Hessians came, saw and conquered. All five musicians were in an extremely good mood and totally motivated, as well as enthusiastic and tight – no other NEW BLOOD AWARD band had a better start. Maybe they overdid it a tad with their assistant in a skimpy attire and their water balloons, but all in all it was a convincing set! The first band outside of the NEW BLOOD AWARD contest and openers of the Nuclear Blast Label Night had been eagerly awaited by the ever-growing crowd in the tent. Already during the announcement of OBSCURE SPHINX as winners of the NEW BLOOD AWARD people were chanting MUNICIPAL WASTE. Understandable as well, because who would fit better in the Party Tent than a band with the reputation of a hard-partying fun troup? Exactly, nobody. No wonder it was full speed ahead during the following hour. Visibly excited and with a clear, powerful sound, the Americans churned out punk-infused Bay Area thrash that put the tent in constant mosh mode. The crowd didn’t need to be asked twice and totally got into the band from the first second. So it happened that a few people lost their shoes in the circle pit, and singer Tony “Guardrail” Foresta could be seen crowdsurfing on a huge airbed. Definitely a nice prelude to the rest of the evening. Prominence with no reticence. During the quartet’s five fulminant sets there were probably quite a few people in the audience rubbing their eyes going “Hang on, isn’t that…?” And yes, there were quite a few famous faces on stage, in the first place obviously frontman R.D. Liapakis from MYSTIC PROPHECY. 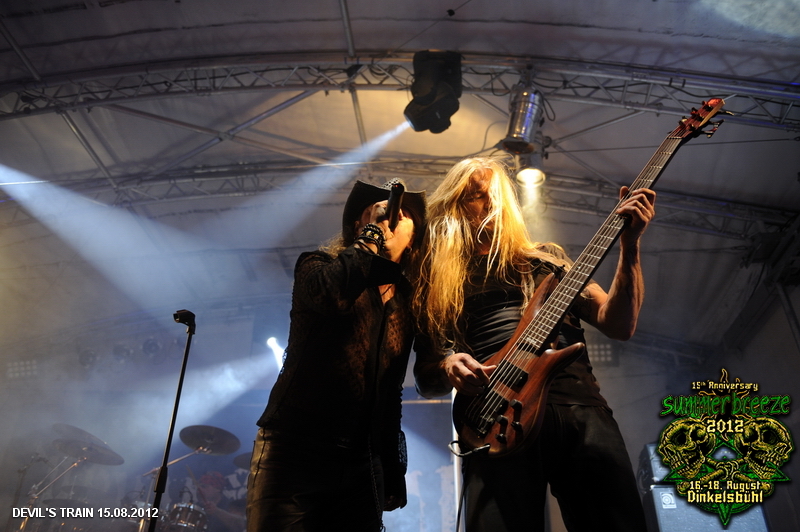 But also beside and behind him there were “name” musicians such as Jörg Michael (ex-STRATOVARIUS) on drums and Jari Kainulainen (ex-STRATOVARIUS) on bass, and from a technical point of view the guitarist was definitely on the same level. So they obviously had a lot going for themselves (how cool was the orange acrylic drum kit please? Bonham anyone?) and the skimpily dressed ladies on their platforms left and right of the stage wouldn’t really have been necessary – but they surely didn’t annoy anyone! Finest heavy / sleaze rock with various cool cover tunes (see setlist) invited to go on board when the DEVIL’S TRAIN made its next stop! 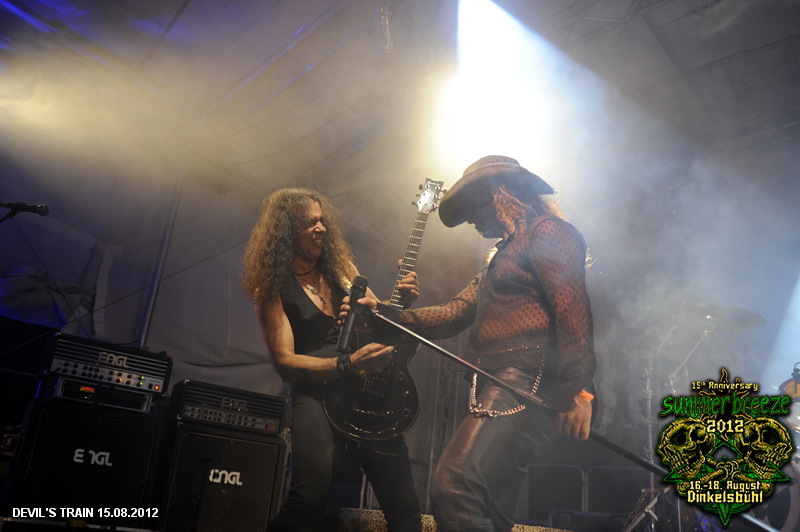 Around 21:00 the tent was pretty full as BULLET, the first classic heavy metal band of the evening, were next on. The five Swedes, who have been a guarantee for party atmosphere on Europe’s festival stages for ten years now, played many classics beside the material from their latest album “Highway Pirates”, pleasing everyone in the crowd. 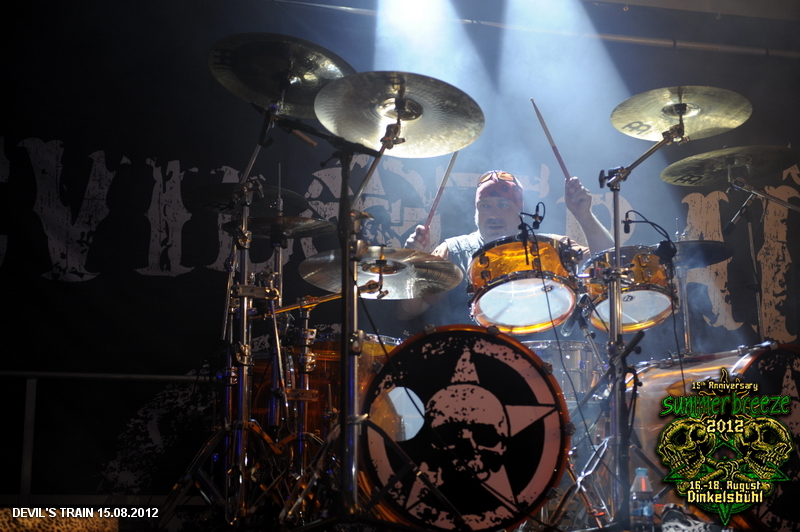 They kicked off the set with “Full Pull”, with Meister Hell giving it all from the very first minute. People kept singing along to songs like “Back On The Road”, “Heading For The Top” and the classic “Dusk Till Dawn”, for an hour heads were banging nonstop and – due to the boiling temperatures – there were a few beer showers to be seen.Traditionally dressed in tube jeans and leather jackets, Erik and Hampus traded off their solos shoulder by shoulder, while drummer Gustav gave his best. The raised fists in the crowd were an impressive sight to behold, and obviously everyone ended up demanding an encore. The guys didn’t have to be asked twice, ending the set with three more diamonds; “Stay Wild”, “Rebels Return” and “Bite The Bullet”. During the encore Hell wore his obligatory red coat, prancing around the stage until the end. After many bows and thank-yous the show was irrevocably over, even though the crowd were still asking for more. You demanded heavy metal, and BULLET delivered as always. Fantastic show! 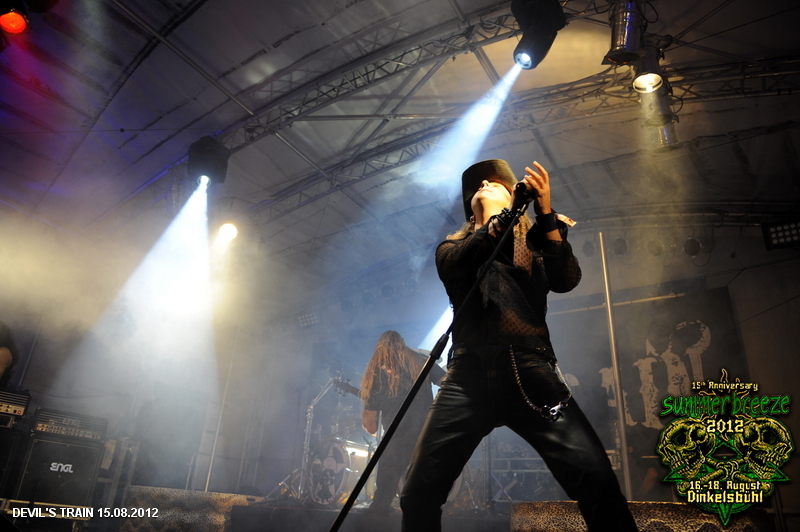 Herne’s RAGE, one of Germany’s true metal institutions, are always welcome at SUMMER BREEZE. So it was no wonder the band led by frontman Peavy drew a massive crowd to the Party Tent to rock out to their classic, powerful heavy metal. As always, RAGE were visibly enjoying themselves, in the first place the likeable Peavy, always with a smile on his face, as well as the mighty 6-string virtuoso Victor Smolski. From the first second there was euphoria in the air, the three veterans managed effortlessly to create a fireworks display of power metal, and the fans enjoyed every note to the fullest. The trio played super tight, proving once more that it is possible to have fun playing despite being a pro, and the fun the band were having was transmitted to the motley crowd, makig the tent totally live up to its name. Especially during those moments when the band dug deep in the vaults to play old classics such as “Refuge” the atmosphere both on stage and off was the best. 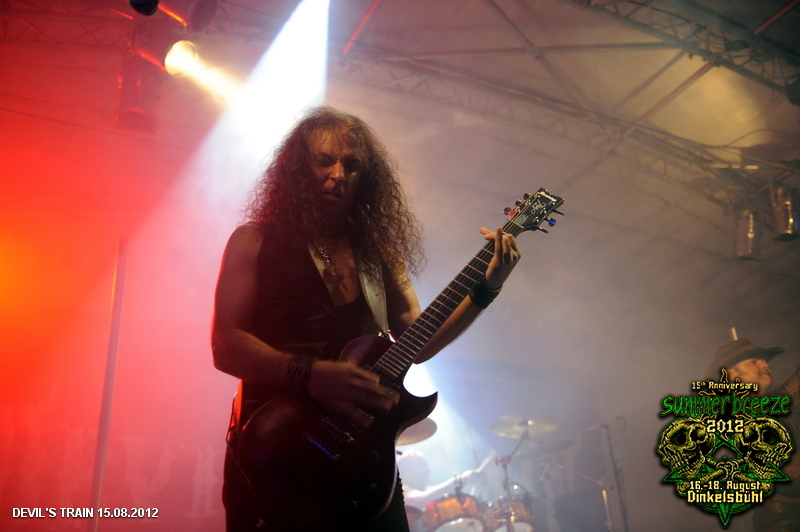 Once again the experienced veterans convinced with their enthusiasm, charm and prefectly executed high-class heavy metal. Until next time! “This is far too late for us old farts” singer Gerre complained during his very first stage rap. But this didn’t keep TANKARD from delivering an enthusiastic set which was entertaining as usual. No wonder there was a lot of action in the tent as the Hessian stage hog and his three sidekicks launched the “Zombie Attack” with their usual professionalism. Although his Weight-Watchers-induced dream body already presented a nice beer spoiler, Gerre impressed the crowd with his energetic stage acting, running around practically nonstop as if stung by a wasp. During the title track of their latest album “A Girl Called Cerveza” the band brought the dancer from the video out on stage as a special gimmick, who only lost the “fight” with the singer when he dragged her away by the (studded) belt. And since one beautiful girl is not enough for TANKARD, during the song “Freibier” thirty-two women were allowed to dance along on stage with a beer in their hands. These little show effects surely contributed to the entertainment factor, but the music would definitely have been enough in itself. TANKARD played an extremely tight show, which ended with the traditional “(Empty) Tankard”, leaving the crowd shouting for an encore, but in vain. GRAVEWORM had only just parted ways with keyboardist and founding member Sabine Mair earlier in the year. Consequentially, they sounded much straighter and less playful than before. Brutality was the name of the game, and even though the crowd had thinned out a bit due to the late hour, the moshing got even fiercer. Frontman Stefan Fiori’s call for a circle pit was pretty much superfluous, as the audience knew exactly what they had to do. 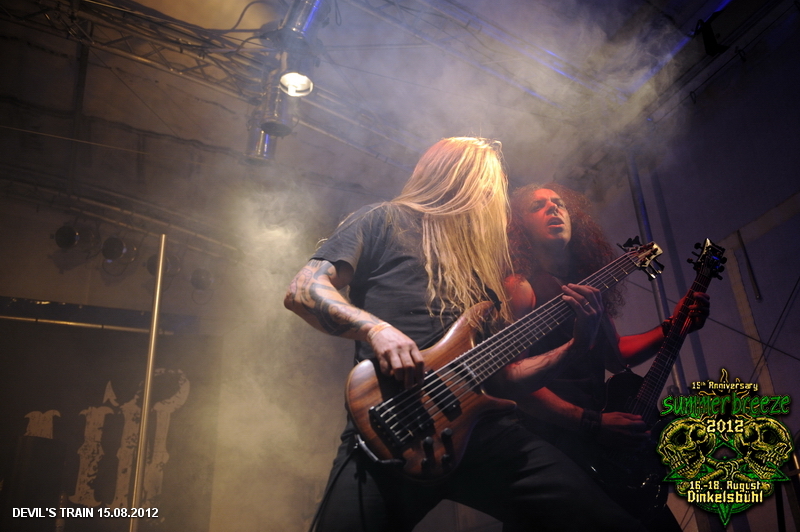 Accompanied by a varied set of brilliantly executed black/death metal jewels, the fans gave their all. However, they couldn’t silence the man with the mic. During grandiose pieces such as “The World Will Die” and “Abhorrence” Stefan Fiori really screamed his lungs out. And, as usual at a GRAVEWORM gig, the set ended with a brutal cover of a metal hit that is originally much more melodic. This time it was the turn of IRON MAIDEN’s “Fear Of The Dark”, which acquired a completely different atmosphere with this process of brutalization. The last band of the Nuclear Blast Label Night was confronted with a difficult task. While GRAVEWORM had still managed to fill a good portion of the Party Tent, their fellow countrymen TASTERS had to fight with a dwindling crowd from the beginning of their set. Yet the Italians were far from discouraged. After a short intro they packed a powerful punch with “Katherine’s Got A Secret”, concentrating mainly on material from their last album “Reckless ‘Till The End” throughout their set. The rather depleted crowd was definitely showing signs of exhaustion due to the heat of the first festival day, but frontman Danielle Nelli was still motivated enough to get the remaining punters moving. Admittedly he didn’t get the circle pit going for “Fight If Your Heart Is Broken” as he would have liked, but the crowd at least followed his instructions to jump up and down. During the song “Disappear” Nelli went down into the crowd before “Please Destroy This World” wrapped up 35 minutes of metalcore with a clear, powerful sound.